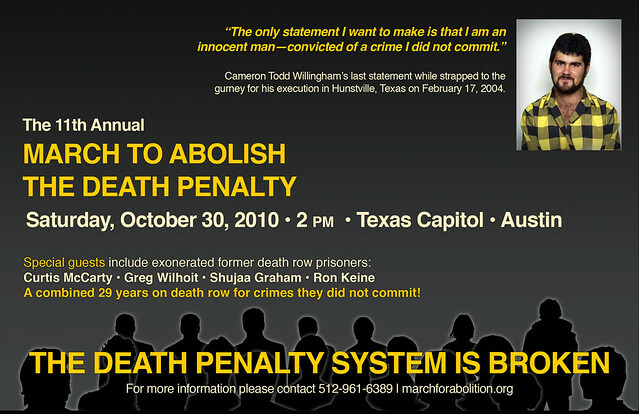 The 20th Annual March to Abolish the Death Penalty will be held on a Saturday at 2 PM in October 2019 at the Capitol in Austin. Exact date to be announced. Texas. The 19th Annual March to Abolish the Death Penalty was Saturday at 2 PM October 20, 2018 at the Capitol in Austin, Texas. The 18th Annual March to Abolish the Death Penalty was Saturday at 2 PM October 28, 2017 at the Capitol in Austin, Texas. Contact us if you would like to volunteer or if your organization would like to be listed as a co-sponsor. The 17th Annual March to Abolish the Death Penalty was Saturday at 2 PM October 29, 2016 at the Capitol in Austin, Texas. The 16th Annual March to Abolish the Death Penalty was Saturday at 2 PM October 24, 2015 at the Capitol in Austin, Texas. The 15th Annual March to Abolish the Death Penalty was Saturday October 25, 2014 at 2:00 PM in Houston, Texas. The 14th Annual March to Abolish the Death Penalty was held in Austin on Saturday, November 2, 2013 at the Texas Capitol at 11th and Congress Avenue. 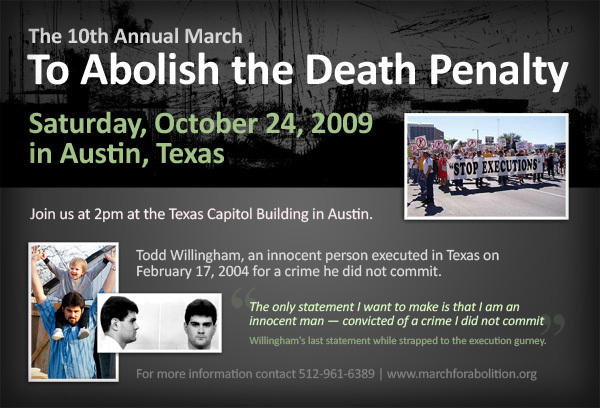 Before his execution, Todd Willingham said,“Please don’t ever stop fighting to vindicate me.” On October 30, you can join the fight by attending the 11th Annual March to Abolish the Death Penalty at the Texas Capitol in Austin. The Tenth Annual March to Abolish the Death Penalty was Saturday, October 24, 2009 at 2 PM in Austin, Texas at the Texas Capitol on the South Steps at 11th and Congress. Hundreds of people attended the march to show the Willingham family and the world that there are people in Texas convinced of his innocence. Todd said, “Don’t stop fighting to vindicate me”, so people came to the march to help fight to vindicate him. Speakers and other confirmed attendees at the march included three innocent, now-exonerated death row prisoners (Shujaa Graham, Curtis McCarty and Ron Keine), Jeff Blackburn (Chief Counsel of the Innocence Project of Texas), Jeanette Popp (a mother whose daughter was murdered but who asked the DA not to seek the death penalty), Elizabeth Gilbert (the penpal of Todd Willingham who first pushed his innocence and helped his family find a fire expert to investigate), Walter Reaves (the last attorney for Todd Willingham, who fought for him through the execution and continues to fight to exonerate him), Terri Been whose brother Jeff Wood is on death row convicted under the Law of Parties even though he did not kill anyone, and Anna Terrell the mother of Reginald Blanton who is scheduled for execution in Texas on Oct 27 three days after the march, plus others to be announced. I believe that Todd Willingham was innocent of the arson/murders. This is Texas where injustice is prevalent. Check out this wrongful conviction: http://www.jamesharryreyos.sclomax.co.uk. Let’s expose all wrongful convictions. Thank you. JAMES HARRY REYOS.